Note that although the order of the spheres is conventional, with the Moon and Mercury closest the Earth and Saturn and the stars farthest, the spheres are convex upward centered on God rather than convex downward centered on the Earth. 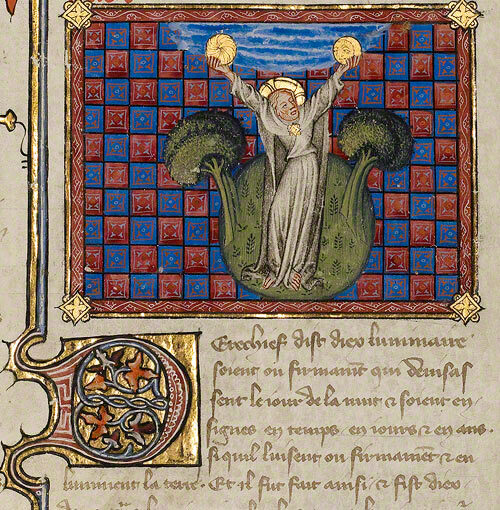 Master of Jean de Mandeville, in Historical Bible (Bible historiale; original sources in Latin), Paris, about 1360–70. 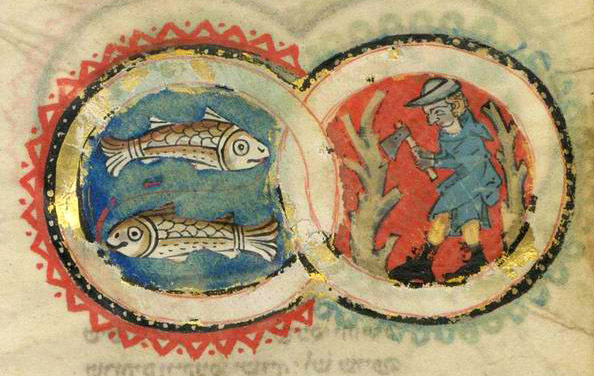 The Tripartite Mahzor (Hungarian Academy of Sciences, Kaufmann Collection, MS Kaufmann A384) is a fourteenth-century prayerbook produced in the area of Lake Constance around 1320. It is divided into three parts. 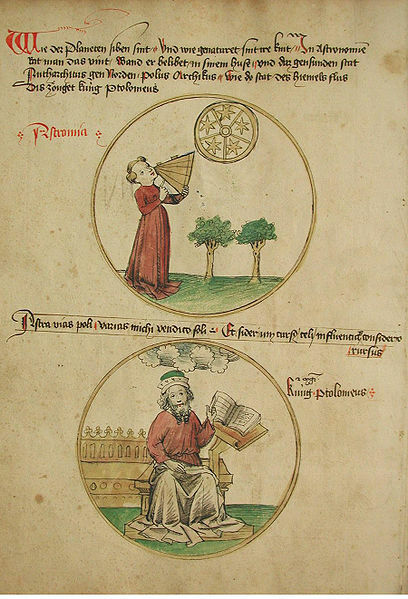 The first part is preserved in Budapest, in the [Kaufmann collection] of the Hungarian Academy of Sciences (MS A384). It contains prayers and piyyuts for the special Shabbats, Purim, Pesah (Passover), and the Song of Songs. The second part (London, British Library Add. Ms. 22413) contains prayers and piyyuts for Shavuot, the Book of Ruth, Sukkot and the Book of Ecclesiastes. In the third volume (Oxford, Bodleian Library Ms. Michael 619) there are prayers and piyyuts for Rosh ha-Shanah and Yom Kippur. While the size of the codices is different, the size of the text areas and the style of the illuminations are the same. Therefore, the three volumes probably originally constituted a one- or two-volume codex, which began with Rosh ha-Shanah and ended with Shavuot. It may have been cut and divided into three parts some time later. None of the volumes has a colophon. The only name given is that of the scribe. He was a certain Hayyim. His name is written at the end of the commentary to Ruth (“חיים חזק”, vol.2, fol. 80v), and this word is decorated in the text in another page of the same volume (fol.103v). A certain scribe Hayyim (חיים סופר) also copied the so-called Schocken Bible (Southern Germany, c.1300; Jerusalem, Schocken Library, Ms.14840), and two close stylistic relatives of the Tripartite Mahzor: the Pentateuch of the Duke of Sussex (Southern Germany; London, British Library, Add. Ms 15282) and the Sefer Mitzvot Katan (Lake Constance Region, probably Konstanz, ca.1310; Vienna, Österreichische Nationalbibliothek Cod. Heb. 75). In the first volume, the prayer for dew is decorated with zodiac signs and the labors of the months (fols.142r-145v). The types of representation of the signs of the Zodiac in our manuscript closely correspond to similar representations in contemporary Christian calendars, breviaries and psalters. 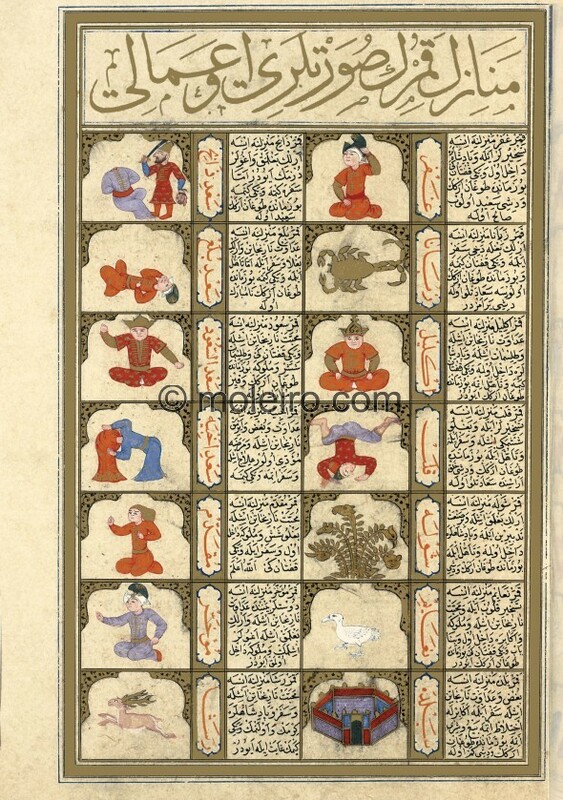 Within the framework of the religio-astrological interpretation of the cosmic system, the Zodiac represents the signs of the night sky while the illustrations of the months stand for the earth by representing the labours characteristic of the given period of the year. The most interesting and most enigmatic of all of them is without doubt the sign of Gemini. Generally, the representation of this sign ranges from a transformation of Castor and Pollux as a caressing pair of a male and female to two armed knights embracing in a fight. In our case we can see two dog-headed figures facing each other holding an unidentifiable device with a shaft in their hands (a mirror with a red frame? a shaft or stick with a red plate? a flower?). It also seems as if the figure on the right had a kerchief on its head, suggesting that the figures are male and female. 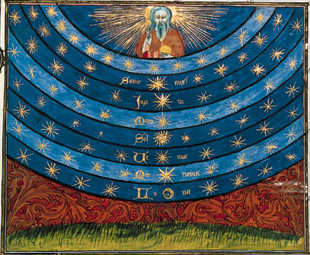 Such a representation of Gemini is unknown elsewhere in Europe, and Gotthard Strohmaier has succeeded in tracing this motif to the Islamic world at the same time recognizing it also in one of the enigmatic ornamentations of a mediaeval German altarcloth dating from the end of the 13th century, the so-called Zehdenicker Altartuch, one of the treasures of the Märkisches Museum in Berlin. The problem requires further investigation. In the accompanying medallion, in Müller’s and von Schlosser’s view, the female figure can be taken to represent the idealized love of mediaeval German courtly and knightly love, Frau Minne, with crown and sceptre, sitting in the flowering branches of a tree and holding a falcon on her left hand. Narkiss and Sed-Rajna recognize in this figure the labour of hawking or the flower-bearer characteristic of the month of Siwan. In Sed-Rajna’s opinion the man is wearing a crown. Perhaps rather a falconer’s cap? In general, both motifs – the falconer/hawking and man/woman with flowers – were common for April-May-June and August. Sed-Rajna stresses that the female figure may hark back to an antique prototype, that of Rosalia, too, representing the awakening of Nature. The fantastic representation of Cancer, perhaps betraying Oriental influence, is also remarkable: “a hybrid animal composed of a wolf’s body and head, a griffon’s paws and a fish for a tail” – this type of representation is unique to our manuscript, it cannot be found anywhere else. Next to it we see a man digging the soil as the labour of the month of Tammuz – while the representation of Scorpion as a tortoise should not surprise us, because an illuminator living in the vicinity of Lake Constance at the beginning of the 14th century may not have had the faintest idea what a real scorpion looked like – the labour of the month of Marheshwan is the vine harvest. It may be noted in this context that the representation of Scorpion as a tortoise among the signs of the Zodiac was common in contemporary Christian art, too. The combined sign of Aquarius and Capricorn radiates a certain rustic atmosphere with the beautiful sweep (draw-well) and the kid quenching its thirst from the bucket. Next to it we see in two medallions a sower and a peasant “holding up a boot while warming his bare foot by the fire, above which hangs a cauldron.” The figure of a man warming himself by the fire was a widespread motif in the representation of the winter months (December, January).